This Design Build project started from a few hand drawn sketches in April 2007. Pre-Construction started from this point with the steel drawings being completed in December 2008. The Brigham Young University (BYU) – Idaho Center is one of the larger auditoriums in America located in Rexburg, Idaho. 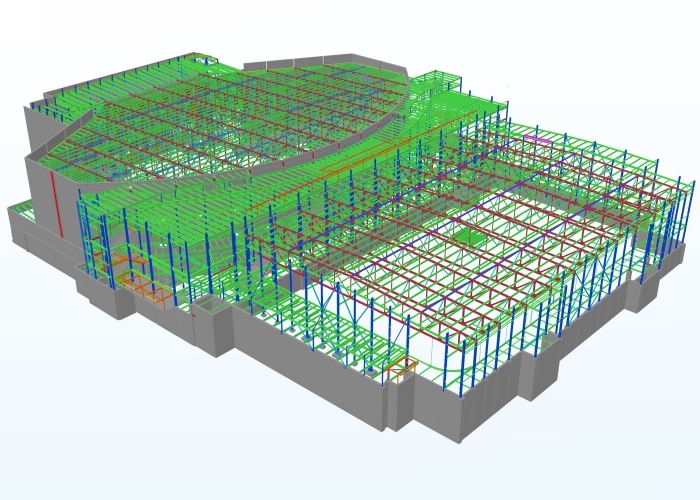 The facility was an exciting project for Global Structural Detailing Ltd. (Global) to work on as it was a design build project and one of Global's first BIM Management Projects. The facility covers 435,000 square feet of campus and contains a Multi-purpose facility with 10 regulation size basketball courts, running track etc. 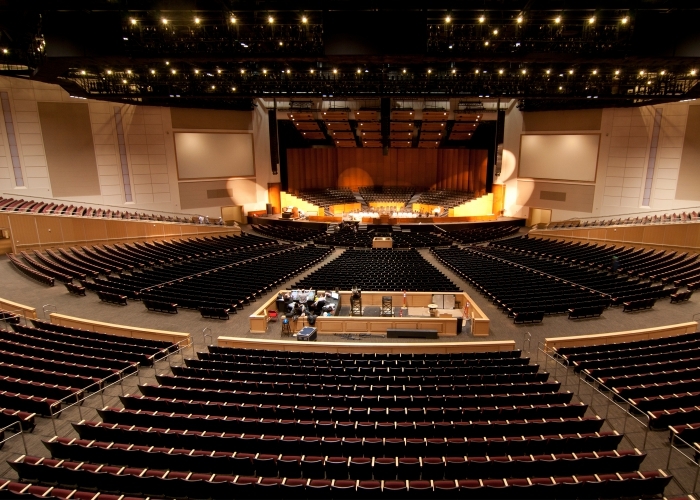 The 15,000 seat auditorium is also part of BYU's largest facility. 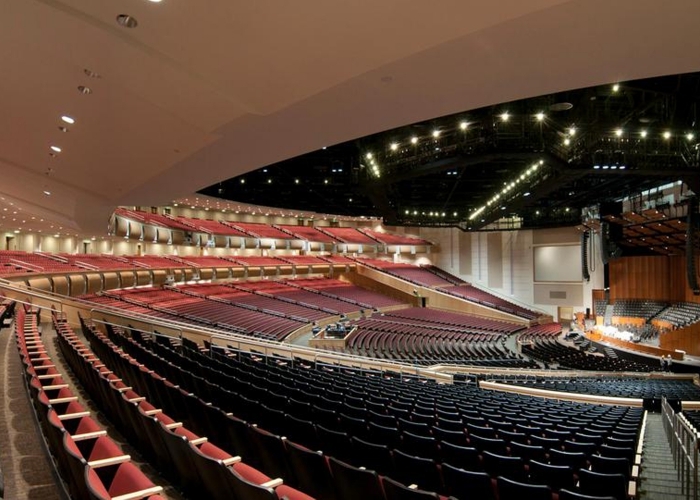 The auditorium occupies about two-thirds of the building, roughly 300,000 square feet. It has 4 acres of roof and is built with 14 million pounds of steel to hold 15,000 people. The project was unique from the start in that its dedication date was pre-set for December 17th, 2010. Due to the Idaho climate with the 2008/2009 winter setting in, the 4 acres of roofing had to be in place before snowfall in order for the other trades to be able to continue through the season as there was a network of tunneling under the Auditorium which could not be completed by Civil until the roof steel was hung. The only way to achieve this schedule was to unconventionally erect the skeleton of the structure and then move inside the structure to erect the interior steel with smaller cranes. 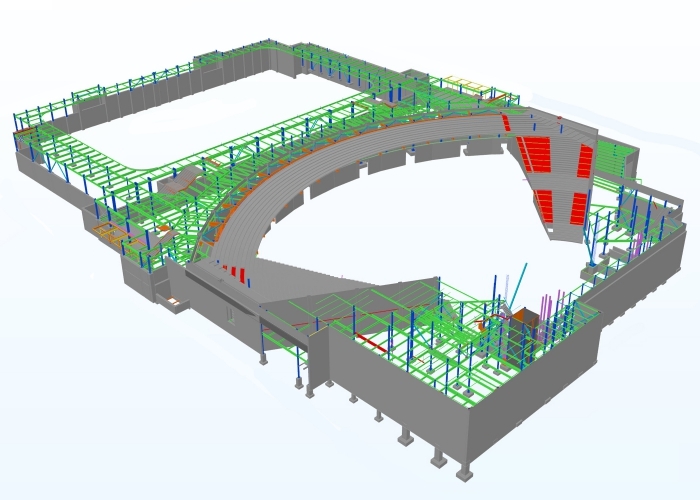 The project was featured inModern Steel Construction April 2009 issue due to its unique method of steel erection & the required accuracy of the massive 260' long & 22' deep cambered trusses connecting to the rear Pre-Cast curved and sloped wall. 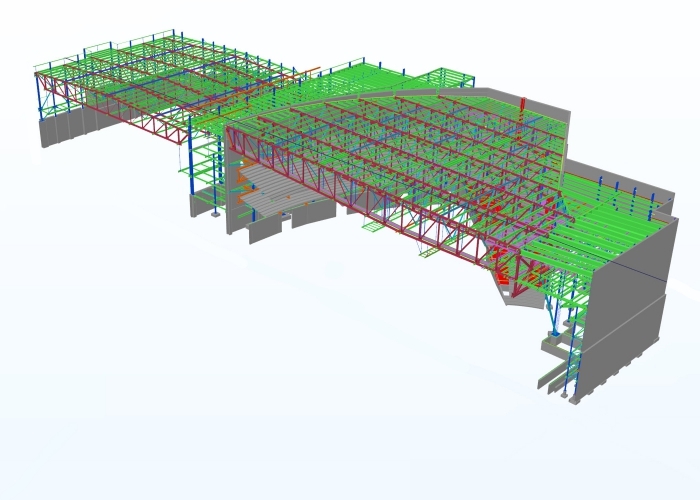 With Global's use of BIM model management with the Pre-Cast supplier model, embedded steel coordination issues were dealt with & the trusses were installed smoothly. 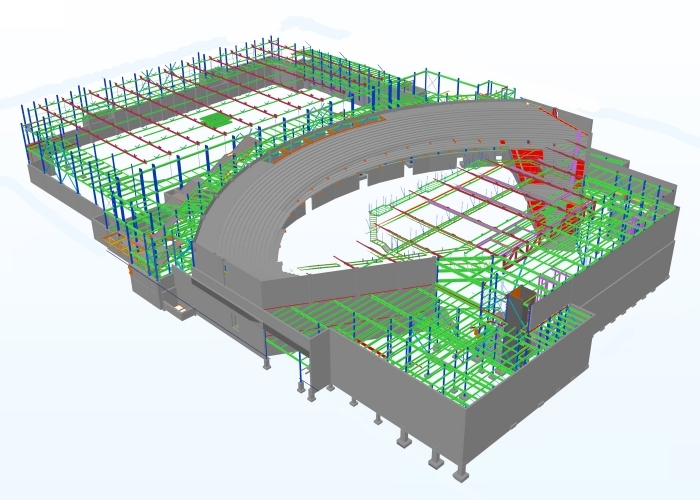 The job was a great showpiece and success story for the use of design build and BIM jointly. © Global Structural Detailing Ltd.